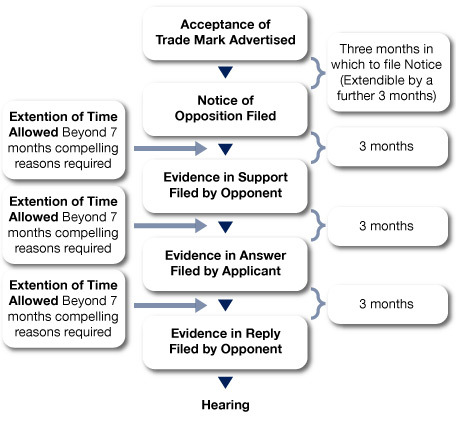 We have information and process diagrams regarding Trade Marks and Design Registrations. A trade mark is a sign which distinguishes one trader’s goods or services from those of other traders. A trade mark can take the form of a word, phrase, letter, number, logo, picture, shape, sound, scent, an aspect of packaging, or any combination of these. In Australia trade mark registration is not compulsory, however protection provides an easier and more cost effective system of enforcing trade mark rights than is available to owners of unregistered trade marks. A trade mark registration entitles the owner to use of the ® symbol on goods and services for which the trade mark is registered. The ® symbol informs other parties of the owner’s exclusive rights to use the trade mark and it acts to deter third parties from engaging in activities which would infringe these trade mark rights. When a registered trade mark is infringed, the trade mark owner may obtain legal relief to stop the infringement and claim damages. Furthermore, trade mark registration also provides a defence against trade mark infringement proceedings brought about by the owner of other registered trade marks. The registration of a trade mark means that the registered owner has exclusive rights to use or licence the trade mark throughout Australia. A registered trade mark can be sold with or without goodwill attached, therefore making it a valuable business asset and bargaining tool. In contrast unregistered trade marks can only be sold with goodwill attached. consist of common surnames or well known geographical names. Furthermore, the trade mark must not be substantially identical or deceptively similar to a registered or pending trade mark. This is why it is imperative to undertake a trade mark search before filing an application. A search can identify any potentially conflicting marks and an assessment of possible difficulties can be made prior to lodgement of the application. 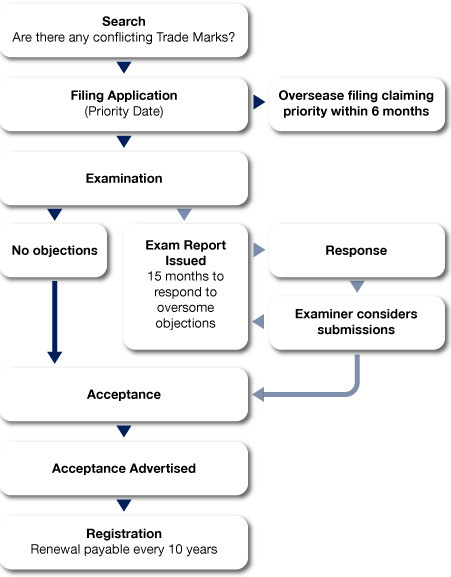 Examination of a trade mark application occurs around four to six months after filing. However, examination can be expedited under certain circumstances, such as the applicant is about to invest substantial capital into the trade mark. If the Examiner accepts the application the trade mark is advertised and third parties are given a period of three months to oppose the registration. Providing no objections are received the application proceeds to registration, on condition that the registration fee is paid. If the application is not accepted then the Examiner will issue a report detailing the objections. A period of fifteen months from the date of issuance of the first Examiner’s report is provided in which time any objection must be overcome. If the objections raised by the Examiner are overcome then the application can proceed to acceptance. Alternatively if these objections are not overcome then the application will lapse. Once registration has been gained the exclusive rights to use the trade mark are perpetual, on the proviso that renewal fees are paid every 10 years. A registered design gives a design owner a monopoly right to the overall visual appearance of a product resulting from one or more visual features such as shape, configuration, pattern and ornamentation. Design Registration in Australia is governed by the Designs Act 2003 which has been introduced with an aim to provide stronger Intellectual Property rights for design owners. Under the Designs Act 2003, a design is registrable if it is both new and distinctive when compared with the prior art base. Prior art base — the prior art base comprises any design publicly used in Australia, any design published in a document anywhere in the world, and any designs which have been disclosed in earlier design applications. The Designs Act 2003 provides that when considering whether a design is distinctive, more weight should be given to similarities between the designs as opposed to differences between them. A search of existing design records is recommended prior to filing an application. After a design application has been made, the applicant has a 6-month period in which to request registration or publication of the design. Publication of a design results simply in the design being published and does not confer any rights. If registration is requested, the design will undergo a formalities examination only and proceed to grant without undergoing substantive examination. 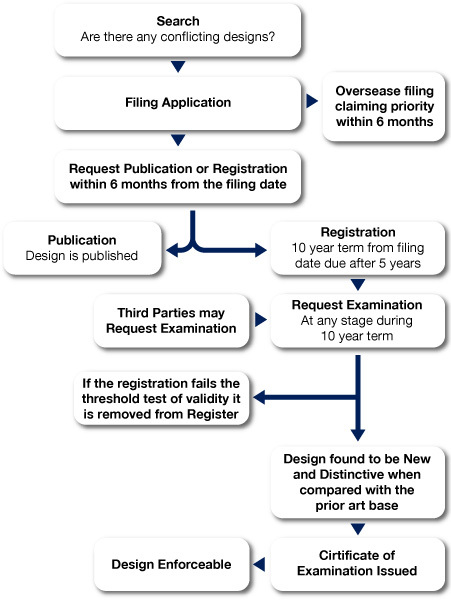 A design is registrable for a period of 10 years from its Australian filing date with a first renewal due 5 years after the Australian filing date. Substantive examination (the test for novelty and distinctiveness) may be requested at any time during this 10-year period to assess the validity of the Registered Design. If the design is found to be valid, it will be certified and a Certificate of Registration will issue. If the design is found to be invalid, the Registration will be revoked. Infringement of a Registered Design occurs if a person makes, imports, sells, hires, offers to sell or hire, or uses for trade or business any product that would be considered an infringement of the Registered Design. A design owner will not be able to enforce a Registered Design by way of infringement proceedings unless the design has been certified. Design registration is available in a number of foreign countries and in many of these countries, the Australian filing date may be retained if foreign applications are filed within 6 months from the Australian filing date.